It is intriguing that my paper, NASA faked the moon landing—therefore (climate) science is a hoax: An anatomy of the motivated rejection of science, continues to attract attention, nearly 7 years after it first saw the light of day and after numerous replications of one of its main findings that has caused such a stir. The most recent report of an association between endorsement of conspiracy theories and the rejection of climate science appeared in Nature Climate Change in an article by Mat Hornsey and colleagues. A few days ago a blogpost appeared under the somewhat alarming headline that Lewandowsky data had been altered. I have not altered any data, but .003 of the observations in the extended data set (139 out of 44,655) differed from those reported in the data set on which the original analysis was based. The differences were sufficiently slight for me not to notice them when I ran a correlational analysis on both data sets (rounded to a few digits) roughly 5 years ago when the data were (re-)posted after I moved to Bristol. Let me first explain the problem: The original analysis as reported in the paper did not include a number of other variables (items) that were surveyed because those additional items were of little relevance to the topic of the paper. Some of those items were analyzed in the online supplement that accompanied the paper, and their existence was also mentioned in the paper itself. For convenience, I posted two data sets after I moved to Bristol (and after a long and nuanced story involving the conflict between UK privacy laws and Australian consent forms). One data set reports the analysis in the paper and the other one additionally reports all other items that have no missing observations for the same 1,145 participants. Because the former data set is a subset of the latter, the variables that are in common between both should be identical. They were, except for two items (FMThreatEnv and CO2TempUp) for which 81 and 59 observations, respectively, differed between the two data sets. In those cases, a “1” was coded as a “2” and a “4” as “3”. The differences appear to be random (i.e., there is no discernible pattern and only 27 participants are coded incorrectly in both variables). So which data set is correct? After checking this all again and re-running the script that dropped potentially identifying information from the data and performed some other minimal preprocessing, I found the published results and the corresponding data set to be correct. Nothing changes anywhere in the paper or the online supplement, except that the extended data set (which was publicly available but which was not used for analysis in the paper) had to be updated. A final question is, how could this happen in the first place? By what mechanism would .003 of nearly 45,000 data points take on different values, seemingly at random? I do not have an answer to that question. There is nothing in my archives that could have generated the initial extended data set. The script I used to strip identifying information and so on delivers the correct results now, and it delivered the same results 7 years ago. Last Saturday, a powerful earthquake struck the Philippines. It was first reported as having a magnitude of 7.2; this was later corrected to 6.8. Last Friday, a wharf collapsed in Gloucester Harbor in Massachusetts. It was first reported as a wharf belonging to Cape Ann Ice, but later identified as a wharf used by Channel Fish. Last Thursday, President Trump announced plans regarding NAFTA. He originally claimed that he would withdraw from the agreement entirely, but later indicated plans to renegotiate. Corrections and retractions are common — not only in the news, but also in science and in everyday life. Sometimes it’s as simple as correcting a careless mistake; other cases involve new information that leads to a reinterpretation of the evidence and the rejection of some prior assumption. We discover that the complaint wasn’t made by our neighbor after all, or that the purported link between vaccines and autism was based on deliberate fraud. The trouble is that initial beliefs are sometimes hard to dislodge. Dozens of studies in experimental psychology have identified a phenomenon known as the continued influence effect: Even after misinformation is retracted, many people continue to treat it as true. In other words, it has a continued influence on their thinking. When misinformation concerns something like the safety of vaccines or the perpetrators behind some atrocity, getting it wrong can be personally and societally consequential. That’s one reason why psychologists have been eager to understand precisely what drives the continued influence effect, and what kinds of corrections are most likely to be effective. A new paper by Ullrich Ecker, Joshua Hogan and Stephan Lewandowsky, forthcoming in the Journal of Applied Research in Memory and Cognition, takes up one important question regarding the correction of misinformation: Is it better to explicitly state and retract the false claim, or is it better to avoid repeating something false, and instead simply state what’s now believed to be true? Both possibilities are suggested by prior research. On the one hand, repeating a false claim could make it more familiar. Familiarity, in turn, could be mistaken for fact, or at least the suspicion that there’s something to the (false) claim. Weeks after reading a brochure about vaccine safety, for example, there might be something familiar about the idea that vaccines are associated with autism, but you might not remember precisely what was claimed, and in particular that the association was refuted. 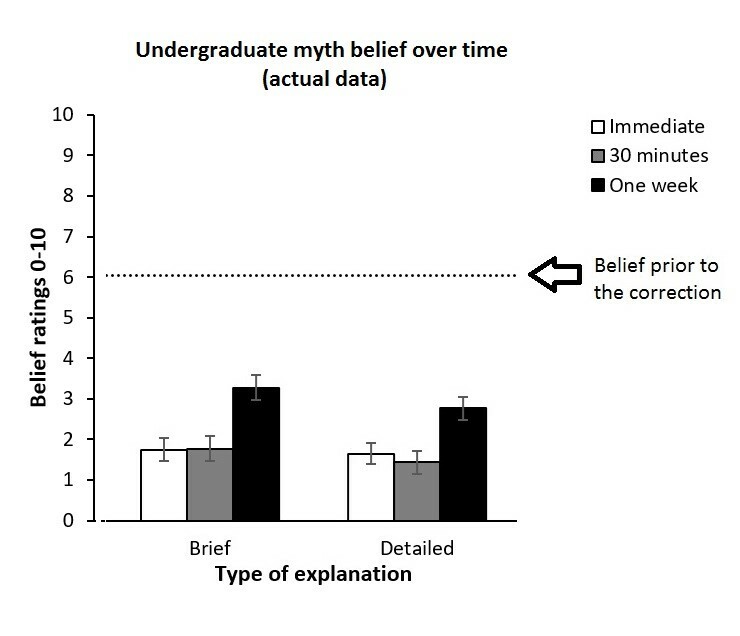 On the other hand, there’s evidence that explicitly articulating a misconception can facilitate the process of updating one’s beliefs. 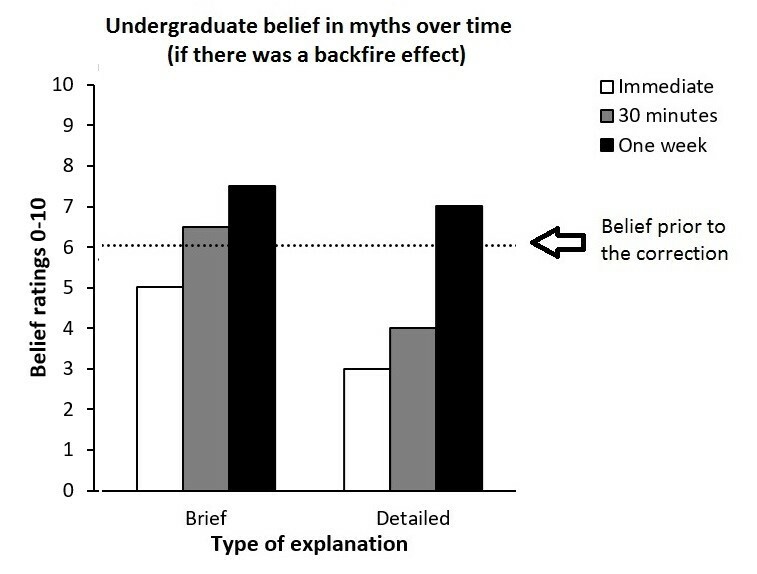 For instance, some approaches to student learning emphasize the value of engaging with students’ initial (mistaken) beliefs as a precursor to conceptual change. Perhaps drawing attention to a false belief is a good way to assimilate the new information in a way that replaces, rather than merely co-exists with, the initial misinformation. 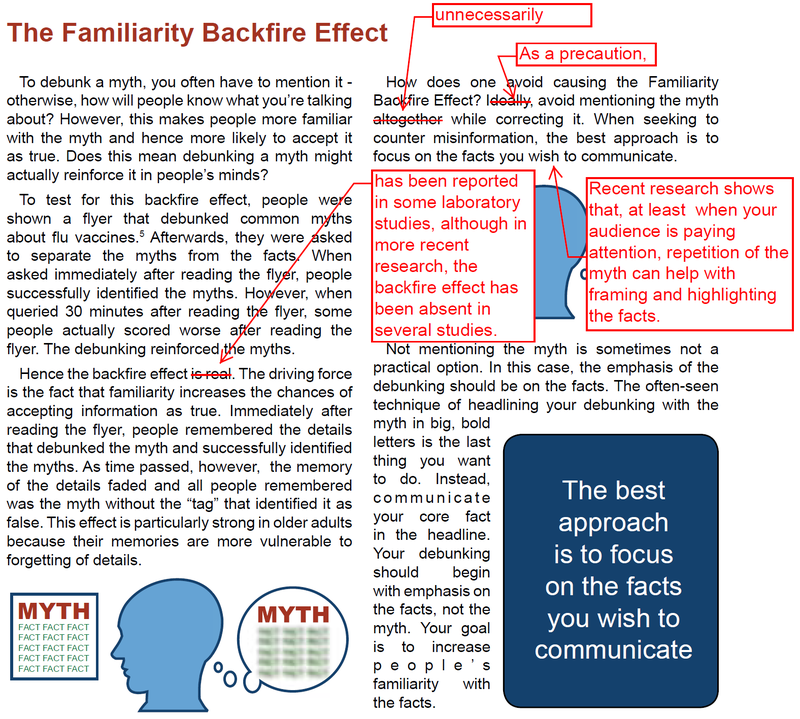 Given these competing possibilities, Ecker and his colleagues designed an experiment in which 60 university undergraduates read a series of scenarios that were written as pairs of news stories, half of which involved a retraction in the second story of some misinformation stated in the first story. The crucial variation was in how the retraction occurred: by merely stating the new claim; by implying that the new claim revised a prior claim (but without stating what the prior claim was); or by including both the initial claim and the new claim that superseded it. To measure the “continued influence” of the initial misinformation, participants were asked a series of questions relevant to that aspect of the news story. 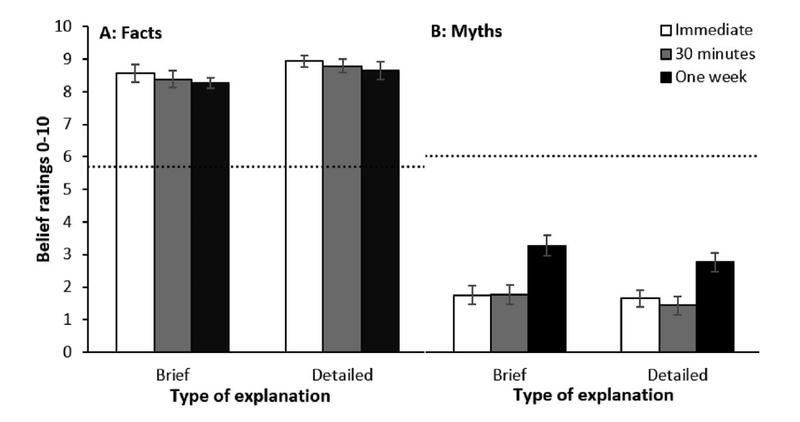 The researchers found that people’s reasoning often showed an influence of the initial, retracted claim, thus replicating prior work. 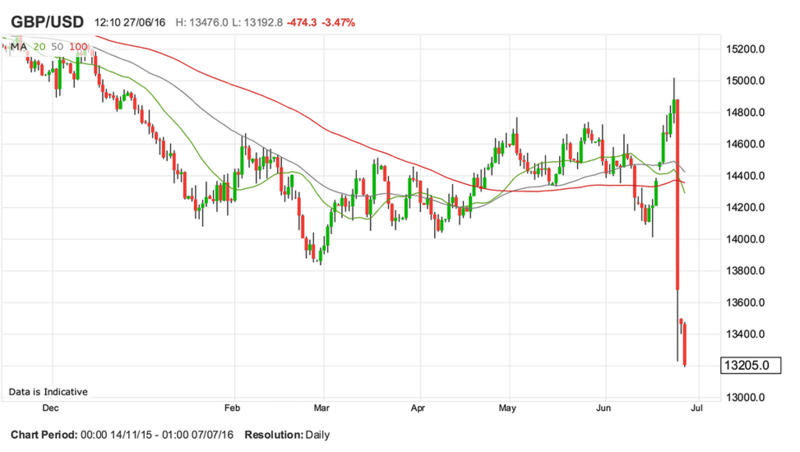 However, they also found that this influence was most pronounced when the new claim was simply stated, and least pronounced when the retraction included both the initial claim and the new claim that superseded it. At least for these scenarios, the most effective retractions were those that repeated the initial misinformation. The study’s authors are cautious about making strong recommendations on the basis of this single result. For instance, they still suggest that unnecessary repetitions of misinformation should be avoided; if someone doesn’t already believe the misinformation, repeating it could do more harm than good. It’s also important to know how robust these findings are to different kinds of (mis)information and different ways in which it is presented. One important factor could be time. Does it matter if the retraction follows the initial information almost immediately, versus after a long delay? Moreover, it could be that the retraction that’s most effective for the few minutes after it’s been read doesn’t have the most staying power as weeks and months go by. These caveats aside, the new results offer an important qualification to prior recommendations concerning misinformation and its correction, some of which encouraged educators and communicators to avoid repeating false claims. At least sometimes, there may be value in repeating misinformation alongside the alternative we now consider to be true. This post was originally published at NPR’s 13.7: Cosmos & Culture page. 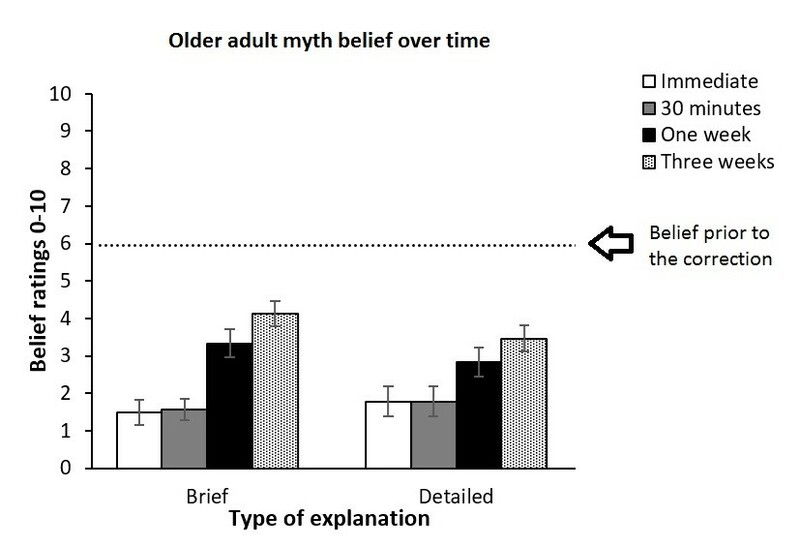 It is reposted here as a first post in a series of three posts on recent research on misinformation by Ulli Ecker, Stephan Lewandowsky, and colleagues. 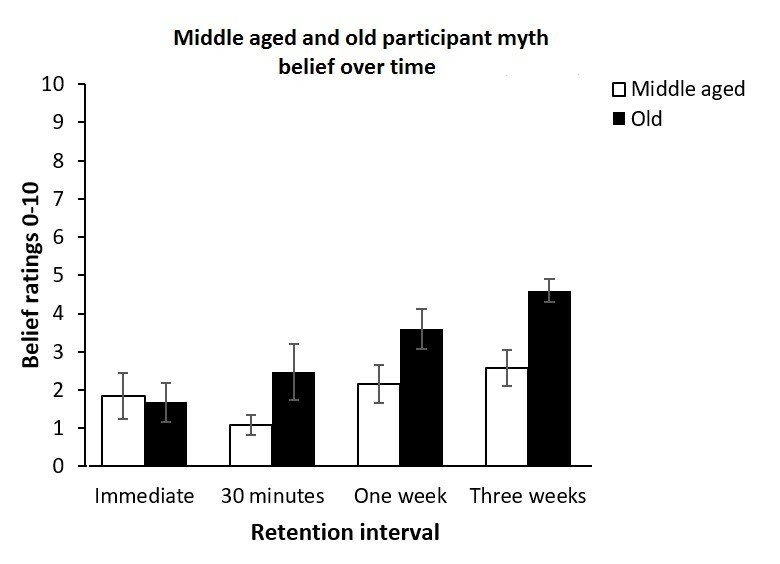 The next post reports a recent study, with Briony Swire as first author, that takes a further look at whether repeating a myth during its debunking is always harmful. An article that just appeared in the journal Global and Planetary Change, authored by me and Mark Freeman and Michael Mann, reported a simulation experiment that sought to put constraints on the social discount rate for climate economics. The article is entitled Harnessing the uncertainty monster: Putting quantitative constraints on the intergenerational social discount rate, and it does just that: In a nutshell, it shows how a single, policy-relevant certainty-equivalent declining social discount rate can be computed from consideration of a large number of sources of uncertainty and ambiguity. I first outlined the basics of the discounting problem and highlighted the importance of the discount rate in climate economics. In the second post, I discussed the ethical considerations and value judgments that are relevant to determining the discount rate within a prescriptive Ramsay framework. In the third post I explained how unresolvable difference between different value judgments can be “integrated out” by a process known as gamma discounting. Those three posts provided us with the background needed to understand the simulation experiment that formed the core of our paper. ρ = δ + η × g.
As explained earlier, the parameters d and h represent ethical considerations relating to pure time preference and inequality aversion, respectively. The anticipated future economic growth is represented by g.
To derive candidate discount rates from this framework we therefore need estimates of future economic growth. We obtained these estimates of g in our experiment by projecting global warming till the end of the century using a climate model (a simple emulator), and converting that warming into a marginal effect on baseline economic growth through an empirical model of the temperature-growth relationship reported by Marshall Burke, Solomon Hsiang and Edward Miguel in 2015. It can be seen that, controlling for all other variables, economic productivity is maximal at an annual average temperature of around 13°C, with temperatures below or above that leading to a reduction in economic output. This descriptive model has been shown to be quite robust and we relied on it to convert warming forecasts to economic growth rates. We projected economic growth as a function of three variables that are the source of considerable uncertainty: the sensitivity of the climate to carbon emissions, the emissions trajectory that results from our policy choices, and the socio-economic development pathway that the world is following. We formed all possible combinations of those three variables to examine their effect on projected global growth. The figure below shows our experimental design. We employed the climate forcings (i.e., the imbalance of incoming and outgoing energy that results from atmospheric greenhouse gases) provided by several of the IPCC’s Representative Concentration Pathways (RCPs). Specifically, we used RCP 2.6, RCP 4.5, RCP 6.0, and RCP 8.5 for the period 2000 through 2100. These RCPs span the range from aggressive mitigation and limiting global temperature rises to approximately 2°C (RCP 2.6), to continued business as usual and extensive warming (RCP 8.5). We compared two Shared Socio-Economic Pathways (SSPs). SSPs form the basis of the IPCC’s projections of future global development in Working Group 3. We employed two scenarios, SSP3 and SSP5. SSP3 assumes low baseline growth and slow global income convergence between rich and poor countries; SSP5 assumes high baseline growth and fast global income convergence. Our experiment thus consisted of 48 cells, obtained by fully crossing 6 levels of uncertainty about climate sensitivity with 4 RCPs and 2 SSPs. For each cell, 1,000 simulation replications were performed by sampling a realization of climate sensitivity from the appropriate distribution. 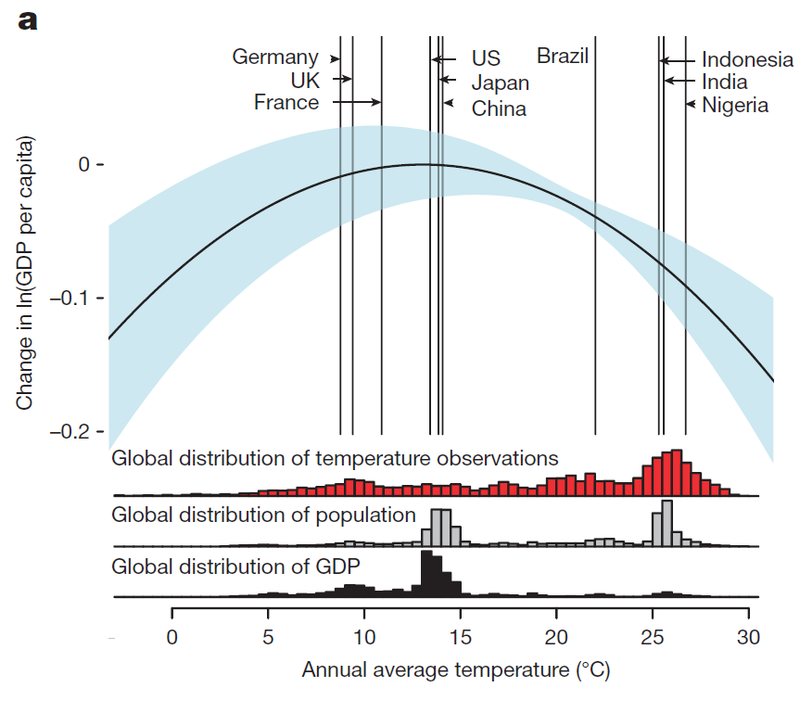 For each realization, global temperatures were projected to the end of the century and the economic effects of climate change were derived by considering the relevant SSP in conjunction with the empirical model relating temperature to economic production. Cumulative average growth rates for the remainder of the century were then computed across the 1,000 replications in each cell of the design. These 48 projected global economic trajectories to the end of the century, each of which represented the expectation under one set of experimental conditions, were then converted into candidate social discount rates. At this stage the ethical considerations (top left of the above figure; see my previous post here for a discussion) were applied to each trajectory, by combining each of the 48 projected global economic growth rates (g) with four combinations of η and δ. Specifically, we used values for η and δ obtained by a recent expert survey, such that δ was either 0% or 3.15% with probability 65% and 35%, respectively, and η was 0.5 or 2.2 with equal probability. This yielded a final set of 192 candidate discount rates across all combinations of experimental variables which were then integrated via gamma discounting into a single certainty-equivalent declining discount rate. I explained gamma discounting in a previous post, and you may wish to re-read that if the process is not clear to you. Although the experiment was quite complex—after all, we explored 3 sources of scientific, socio-economic, and policy uncertainty plus 2 sources of ethical ambiguity!—the crucial results are quite straightforward and consist of a single declining discount rate that is integrated across all those sources of ambiguity and uncertainty. The figure below shows the main result (the article itself contains lots more but we skip over those data here). The solid black line represents the (spot) certainty-equivalent declining discount rate that applies at any given point in time. For example, if we are concerned with a damage cost that falls due in 2050, then we would discount that cost at 3%. If we are worried about damages at the end of the century, then we would discount that cost by less than 2%. 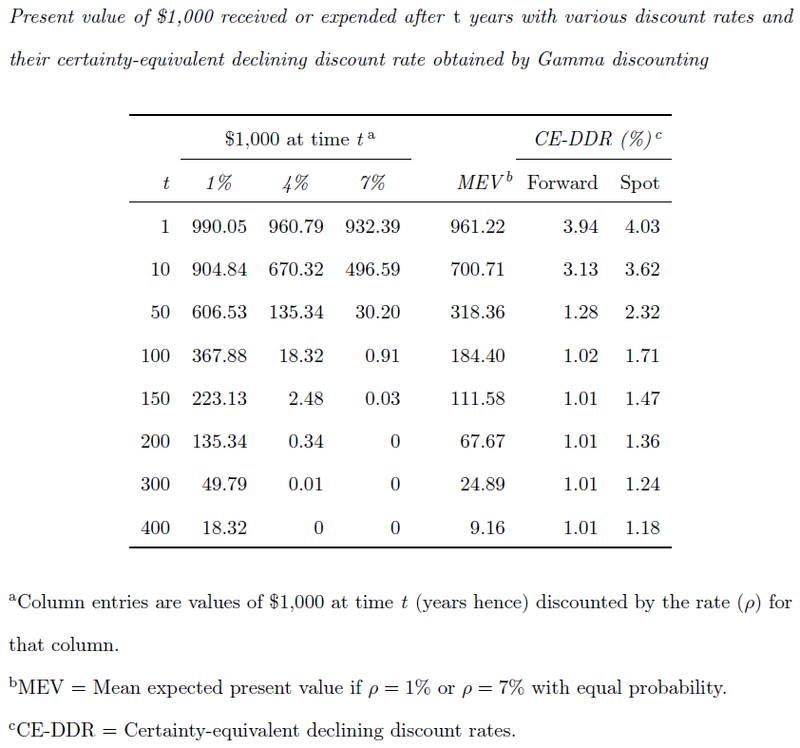 The figure also shows various previous estimates of declining discount rates that were derived by different means but all based on the underlying principle of gamma discounting. Our approach differs from those precedents in two important ways: First, we explicitly consider the major (if not most) sources of uncertainty and ambiguity, and we encompass their effects via gamma discounting. Second, our approach explicitly models the impact of future climate change on economic production. When the likely impact of climate change on the global economy is considered, a more rapid decline of the discount rate is observed than in previous work. By 2070, our estimates of the spot rate dips below the other past benchmark estimates in the above figure. It should be noted that our results mesh well with the median long-run social discount rate elicited from experts. We consider this article to provide a proof of concept, with much further exploration remaining to be performed. We take up some of those open issues and the limitations of our work in the article itself. There is one clear message from our work: uncertainty is no reason to delay climate mitigation. 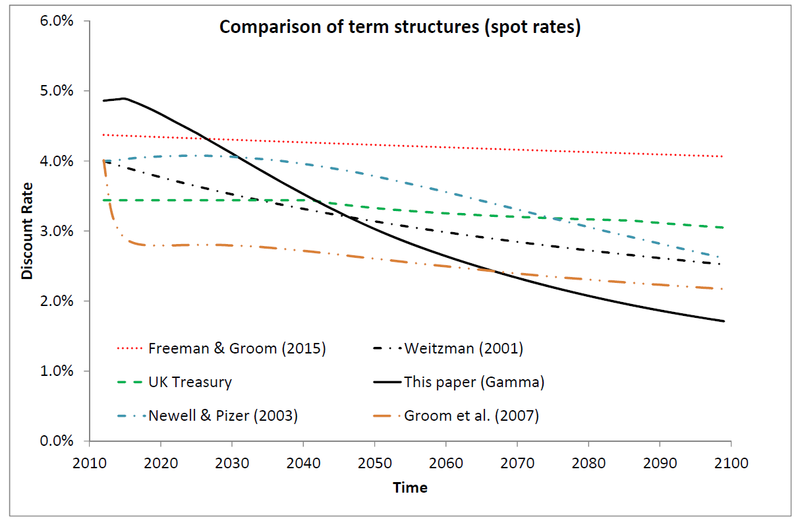 Quite on the contrary, our extensive exploration of uncertainty yielded a lower discount rate (form around 2070 onward) than existing proposals. This lower discount rate translates into a considerable increase in the social cost of carbon emissions, and hence even greater impetus to mitigate climate change. One caveat to our conclusion is that our discounting model assumes that things can be done only now or never. This makes sense in many situations when individuals or firms are confronted with a choice about a potential project. However, there are limitations to this approach. To take an extreme example, suppose we knew that the precise value of climate sensitivity would be revealed to us by some miraculous process in exactly a year’s time. In that it case, it would not be impossible that we might decide to wait that year to learn the precise climate sensitivity before acting. A possible alternative approach that stretches the decision path over time involves so-called real options models. Real options analyses account for the sequential nature and path dependence of choice processes. We flag this alternative briefly, but it remains for future work to apply it to climate economics in a more systematic fashion. In the previous two posts, I first outlined the basics of the discounting problem and highlighted the importance of the discount rate in climate economics. In the second post, I discussed the ethical considerations and value judgments that are relevant to determining the discount rate within a prescriptive Ramsay framework. I showed that those ethical considerations can yield unresolvable ambiguity: different people have different values, and sometimes those values cannot be reconciled. Fortunately, in the discounting context, we can “integrate out” those ambiguities by a process known as gamma discounting. This is the topic of the remainder of this post. It turns out that recent work in economics has proposed a way to resolve such ambiguity or uncertainty. This process is known as gamma discounting. In a nutshell, instead of averaging the candidate discount rates, the process averages the discounted future values for each candidate rate. The table below illustrates gamma discounting using an example provided by Ken Arrow and colleagues. The table shows discounted values of $1,000 at various times t in the future for three different candidate discount rates (namely, 1%, 4%, and 7%). For example, if the rate is 4%, then the discounted value of $1,000 after 50 years is $135.34, and so on. So how do we deal with the uncertainty about the discount rate? Suppose we assume that the rate is either 1% or 7% with equal probability, then 50 years from now our $1,000 can be worth either $606.53 or $30.20 (also with equal probability). It follows that the average of those two uncertain values represents the probability-weighted expectation for our $1,000, which 50 years from now is ($30.20 + $606.53)/2 = $318.36. These averages are called the “mean expected present values” and are shown in the column labeled MEV. They form the basis of our final computation. The ratio between successive MEVs yields a single certainty-equivalent discount rate (columns labeled CE-DDR) for any given point in time. For example, the MEV at t = 50 is $318.36, and the MEV at t = 51 is $314.33. The ratio between those successive values, $318.37/$314.33 = 1.0128 = 1.28%, provides the CE-DDR at time t = 50, known as the “forward” rate, and those values are shown in the second-to-last column of the table. Several important points can be made about that column: First, there is only one column. No matter how many candidate discount rates we started out with, and what their probability weighting might be, we end up with a single certainty-equivalent discount rate that can be applied with 100% certainty, but that has embedded within it the uncertainty we started out with. Finally, the second-to-last column captures the slope of the declining discount rate function between times t and t + 1. Those forward values, however, cannot be used to discount an amount from the present to time t—for example, the MEV at time t = 50 cannot be obtained by discounting $1,000 at a rate of 1.28% over 50 years. Instead, to obtain a rate that covers all of those 50 years, we need a different certainty-equivalent discount rate that is also declining but generally has higher values. This rate is called the “spot” certainty-equivalent declining discount rate and is shown in the final column. If we apply the “spot” rate to our present-day $1,000 for time t, it will yield the MEVs for that time shown in the table. For example, $1,000 discounted at 2.32% over 50 years (i.e., 1000/1.023250) yields the MEV of $318 (± rounding error). To summarize: We start out by being uncertain about the discount rate. For example, we don’t know whether to set the pure time preference to zero or to permit a value greater than that. We apply gamma discounting and this uncertainty has “disappeared”. Of course, it hasn’t really disappeared, it has just been taken into account in the final certainty-equivalent discount rate. But for all practical intents and purposes, we now have a single number that we can apply in economic decision making. In the first post, we considered the implications of the discount rate if climate change were to cause $5 trillion (i.e., $5,000,000,000,000) in damages by the end of the century. We noted that the present discounted cost could be as large as $2.2 trillion (discount at 1%) or as little as $18 billon (at 7%). If we assume that 1% or 7% are equally likely to be “correct”, then from the table above we can obtain a certainty-equivalent spot rate of somewhere below 2% (the end of the century is 83 years away, but that’s reasonably close to the 100 years that yield a spot rate of 1.71%). It follows that to avert $5 trillion in damages, it would be economically advisable to expend in excess of $1 trillion now on climate mitigation even if we are uncertain about which discount rate to apply. This post explained the basic idea behind gamma discounting. We now have a mathematical platform to convert ambiguity and uncertainty about the discount rate into a single certainty-equivalent discount rate. The beauty of gamma discounting is that it is theoretically particularly firmly grounded when the candidate discount rates (the first three columns in the above table) arise from irreducible heterogeneity among expert opinions rather than from random variation about an imprecise estimate. Different ethical positions about inequality aversion (η; see previous post) and pure time preference (δ) are clear instances of such irreducible heterogeneity. In our simulation experiment, we considered the uncertainty about three other relevant variables as similar cases of irreducible heterogeneity; namely, uncertainty about climate sensitivity, uncertainty about emissions policy, and uncertainty about future global development. To briefly foreshadow the final post, we conducted a simulation experiment that forecast economic growth till the end of the century under all possible combinations of those variables. We then applied gamma discounting as in the table above to extract a single certainty-equivalent declining discount rate that policy makers can apply in the knowledge that a broad range of uncertainties has been considered. We must discount, but how much? 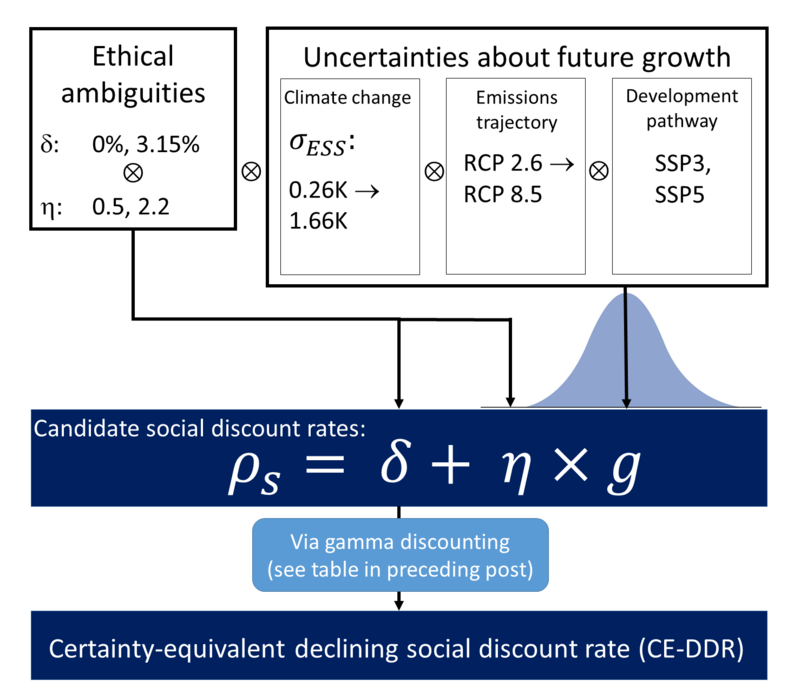 In a previous post, I outlined the basics of the discounting problem and highlighted the importance of the discount rate in climate economics. In the remainder of this post, I will outline the ethical considerations and value judgments that are relevant to determining the discount rate. Because those considerations may yield unresolvable ambiguity, they must be “integrated out” by a process known as gamma discounting. This will be explained in the next post. A further post will explain our simulation experiment and the results. When individuals or businesses make decisions about investments, they tend to use the prevailing market interest rates to set the discount rate. This approach, known as the descriptive approach to setting the discount rate, makes perfect sense for short or medium-term time horizons when the costs and benefits of a project involve the same people and the same markets. The approach is called descriptive because the discount rate correctly describes how society actually discounts, as determined by the markets. An alternative approach, called the prescriptive approach, prefers to estimate the social discount rate directly from its primitives rather than using market rates of interest. In this context, the discount rate is usually called the social discount rate because it applies not to individuals or firms but to society overall. The approach is called prescriptive because it imposes a rate on social planners that is, at least in part, based on value judgments. There are a number of arguments that support the prescriptive approach. For example, many economists and philosophers would argue that we cannot discount with respect to future generations. That is, present-day decision makers should not endorse policies that inevitably disadvantage future generations, who have no power to resist or retaliate against present-day decisions. In addition, those most affected by climate change—the poor, often in developing countries—do not influence market interest rates. This arguably places a burden on governments to take a wider ethical perspective than investors who trade in financial markets. It can be seen that the social discount rate, ρ, results from two distinct components: A component known as the “pure time preference”, encapsulated by δ, and a component that combines the expected average annual real economic growth rate, g, with a parameter η that turns out to capture people’s inequality aversion. (It also does other things but here we focus on inequality aversion). The pure time preference is simply our impatience: It’s our impulse that $50 today is “worth more” than $51 in a month, even though the accrual during this delay would correspond to a whopping annual interest rate of nearly 27%. The rationale for inclusion of the growth rate is that growing wealth makes a given cost for future generations more bearable than it appears to us now, in the same way that $100 is valued a great deal more by a poor student than by a billionaire. Within the Ramsey framework we thus have to consider three quantities to determine the social discount rate: Future economic growth, inequality aversion, and pure time preference. Future growth rates can be estimated by economic modeling—and that is precisely what we did in our article, and I will describe the details of that in the next post. To illustrate the ethical implications I focus on δ, the pure time preference. I will ignore issues surrounding η for simplicity. It has been argued that it is ethically indefensible for δ to be greater than zero, as it would embody “a clear violation of the attitude of impartiality that is foundational to ethics”. That is, we should not disadvantage future generations simply because we happen to have been born before them. If one wanted to treat future generations equally to ours, as most people seem prepared to do, one would therefore want to constrain δ to be zero—and indeed, in the U.K.’s influential Stern report, δ was set to (near) zero for that reason. However, the seemingly attractive idea of treating all generations equally by setting δ to zero entails some unnerving consequences. In general, the lower the discount rate, the more future consumption (or cost) matters and hence the more we should set aside for the benefit of future generations. Partha Dasgupta computed the mathematically implied savings rate when δ is set to the value recommended in the Stern report and found it to be 97%. That is, out of $100 we currently own, we may only consume $3, with the remainder being tucked away for the benefit of our children. Our children, in turn, would also only be allowed to spend $3 of their considerably greater wealth, with the remainder being passed on to their children, and so on. An implication of d being near zero therefore is the impoverishment of each current generation for the benefit of the succeeding one! So what is the “correct” value of δ? But we do know that in a recent survey of 200 experts, Moritz Drupp and colleagues found that the distribution of expert responses was closely approximated by setting δ to zero with 65% probability and setting it to 3.15 with 35% probability. Do we make policy decisions based on majority rule? Or based on the average of the two sets of expert opinions? Or do we decide that experts are no good and that we should ask Bruce at the pub? The next post presents a solution to this dilemma known as gamma discounting.